* Our colleagues are our friends, our friends are our family. 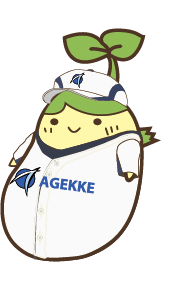 Today AGEKKE GROUP (pronounced as “A-JACK” derived from merger of “Age” and “Make”) is one of the largest Japanese HR consultancies: 15 000 employees and 105 office in Japan, South Korea, China and Russia with annual revenues in excess of 700 million USD. Our history began in Tokyo in 2001, thus it is fair to say that we are young and dynamic. We entered Russian market in 2007, and have since progressed unyieldingly in the fulfillment of the simple strategy – be the Number One provider to each of our valued Customers. We view long-term relationship as more important than a one-time sale. We are not inert, however, and are constantly on the lookout for new challenging opportunities. Our spirit is epitomized in our mascot, Mame-chan. She is young but very energetic, she demonstrates flexibility, joie de vivre and reliability (a word play in Japanese: “mame” as a noun means “bean, pea”, but as an adjective translates as “conscientious, diligent”). Mame-chan has a dream – when she has grown, she’ll have a beautiful flower blossom up on her little stem. We find it wonderful – to have a dream and follow it through. Despite the simplicity of its symbol, during the relatively short span of its life, Agekke has grown from a small start-up to a group of companies encompassing 16 strategic business units, operating on the global market. We hold on to our principles and believe in what we do. Find out more about us, and we are confident that together we can accomplish a lot!